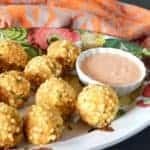 Sabudana Vada - Spicy Tapioca fritters with an healthy twist! Rinse and soak sabudana in half cup of water for 3-4 hours. Dry roast skinned peanuts and grind them coarsely. Boil, peel and mash the potato. Coarsely grind cumin seeds and green chillies. Mix all the ingredients and cilantro with some salt to taste. Make lemon sized balls. Heat the paniyaram/aebleskiver pan on medium low heat. Add a few drops of ghee in each round section. Place the fritter balls in each section and cook covered for 4-5 mins. Gently flip the fritters using chopstick or small spoon to cook the top side. Add few more drops of ghee on top of each fritter. The one's in the center definitely cook much faster, so they will have to flipped first. Cover and cook again for another 4-5 mins on medium low heat until they turn crisp and golden brown. While the fritters are cooking, whisk together yogurt, ground peanuts, red chili powder, sugar and salt to make the chutney. Serve the fritters hot with this sweet and spicy chutney!